Google knows a lot of people out there spend a lot of time using YouTube, but it’s always looking for ways to help you consume more content. 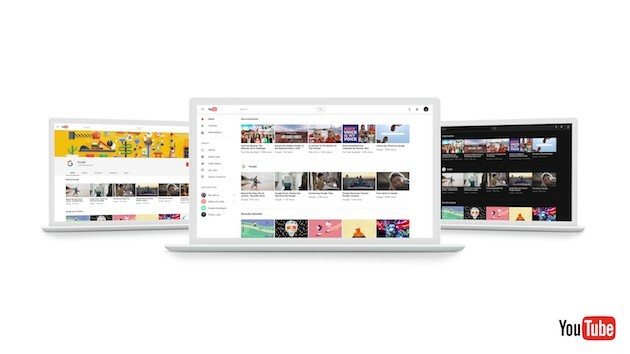 Google makes tweaks to YouTube in the hope that they’ll make it easier for you to find new content to watch and stick around a bit longer. Today, Google announced that there is a big change coming down the pipe: A new look for YouTube. Google is applying Material Design to the YouTube desktop experience, starting with a preview that you can opt into right here if you’re so inclined. With it, Google wants to create an insightful user experience that’s simple to navigate, in part by removing visuals that can distract from the browsing or viewing experience. Google is using a faster framework called Polymer to roll out the changes, which also means that it can streamline feature rollouts, too. For instance, the biggest new addition has to be a brand new dark theme. Google says it will cut down on glare and make the colors in your videos pop a bit more. After the dark theme has been enabled, it will consistently stay active as you navigate YouTube from one video or channel to the next. So, Material Design and a dark theme. Do you approve of these changes?